The Natural Resources Defense Council has just completed rigorous measurements of the power use of the newly released U.S. versions of the Sony PlayStation 4 (PS4) and Microsoft Xbox One. We found that the new models have made substantial progress on energy efficiency compared to their predecessors, the PS3 and Xbox 360. 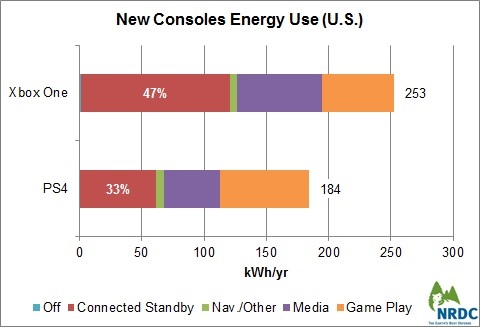 But despite these power-saving advances, the new consoles' higher performance and new features result in up to three times higher annual energy consumption than the most recent models of their predecessors. That adds up to a lot of energy every year. In fact, even if these new video game consoles became 25 percent more energy efficient on average over time – which we believe is possible – they would still use between 10 and 11 billion kilowatt hours of electricity annually once the new consoles have replaced the more than 100 million units currently in use. This translates to four large power plants and over $1 billion in annual electricity bills. 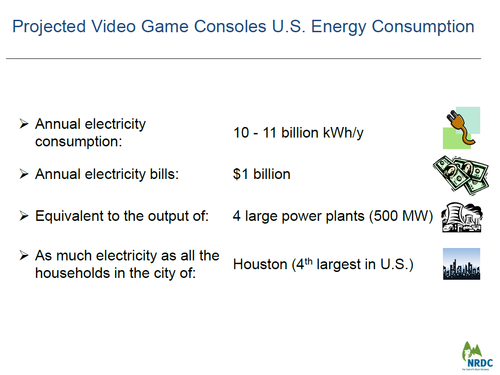 To put this into further perspective, video game consoles in the United States are projected to use more electricity annually than all the households in Houston, America’s fourth-largest city. Fortunately, a number of relatively simple enhancements can reduce this energy consumption by more than 25 percent. Here’s a summary of some of our findings and key opportunities, in advance of NRDC’s full report scheduled for release early next year. The Good – To their credit, Sony and Microsoft have done a lot to make sure the energy use of these devices was not even higher. They use very efficient power supplies to minimize energy losses in power conversion, advanced multi-core chips that can throttle down power use when the task at hand does not require full power, and well-designed “auto power down” software so the device automatically drops to a lower power state after an extended period of user inactivity. The new models also allow for charging the USB controller and headset from sleep mode, eliminating the need to keep the console on just to charge accessories. And Sony and Microsoft each came up with an innovative energy efficiency feature: after 10 minutes of inactivity, PS4 reduces console power in Navigation mode while Xbox One dims the TV. The Problem – When you add it all up, however, the new consoles may still use up to three times more energy than their most recent predecessors because of a combination of factors: they use more power to play games and watch movies, and use that power over a longer period of time, particularly while in sleep mode (called Connected Standby) when you may not even be in the room or charging accessories, and in TV mode, when you use the Xbox One to control the TV. In all of the active modes, the PS4 requires significantly more power to perform similar tasks as the Xbox One. Although the PS4 delivers higher resolution images and uses a more powerful graphics processor, its power levels should be closer to the Xbox One. However, the Xbox One uses twice as much power as PS4 when in “connected standby” (called “Instant On” on Xbox One), the default mode most U.S. users will experience when they turn their device “off” unless they change settings to the Energy Saving mode. While in connected standby, the Xbox One is consuming all this power waiting for the user to walk into the room and say “Xbox on,” even if nobody is home. Both devices have a more traditional “off” state that uses less than 1 watt of power, but it is unlikely many users will get there given the design of the set-up menu. How much energy do these devices consume annually? 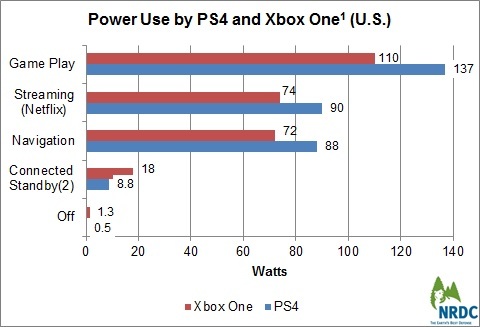 – After applying a typical usage pattern to these power measurements, NRDC found the Xbox One uses more energy per year than the PS4 due to its very high connected standby power level, the mode where the boxes reside for most of the day. This “always listening” feature is responsible for almost half of the Xbox One’s annual energy use and consumes more electricity annually than the 50-inch TV to which it might be connected. Given Microsoft’s recent release of its “carbon fee playbook” about its leadership in the area of reducing company-wide carbon emissions, we anticipate the company will make it a priority in future updates for the voice recognition feature to use a lot less power when no one is home or likely to use the console. In addition, Microsoft’s business plan that seeks to make the Xbox One the media hub of the living room will likely result in increased hours of operation and console energy use. People who use this feature to watch YouTube videos, cable TV, etc., will have their console on for as long as their TV, which is roughly five hours daily. Over five years, the Xbox One’s 250 kilowatt hours per year usage represents roughly $150 in electricity costs, enough to buy two or three new games! a) Sony to reduce active mode power levels of the PS4 closer to those already achieved by the Xbox One. Both use the same AMD “system on a chip” in their consoles so this should be attainable through system software enhancements with little or no hardware changes. b) Microsoft should bring down the energy use of its consoles in connected standby. There is no reason they should consume over 100 kWh per year, mostly in the middle of the night waiting to hear someone’s voice asking the console to wake up. c) Sony’s PS4 uses 8 watts of power in connected standby when USB charging is enabled. While this is a good feature as users can charge their controller and headset without leaving the console on and fully powered, laptops perform this function for only 1 watt and Sony should strive to achieve similar levels. d) Sony and Microsoft both need to work toward bringing down the power needed to stream video or other media content. Standalone devices like Apple TV and Roku need less than 5 watts to stream HD movies – a whopping 15 times lower than PS4 and Xbox 360. This improvement is even more critical for Microsoft’s Xbox One due to its TV integration mode, which may result in the device operating for more hours and consuming more energy. We are hopeful that Microsoft and Sony will implement these recommendations quickly, game on!